Moringa has been gaining popularity in grocery stores all across the country. While you may have only seen the word “moringa” in the last few years, moringa has been used by cultures all over the world for thousands of years. Today in the US, you can find moringa being used in energy shots, smoothie mixes and more. This leafy green is bursting with nutrients and just a little bit can supercharge your day and revamp your health. Here are 10 reasons to eat moringa every day. Moringa is a fast-growing leafy tree that thrives in hot, arid climates. Moringa has become recognized as a powerful tool for improving nutrition around the world due to its nutrient density and resistance to drought. Moringa doesn’t require a lot of intensive labor for harvesting or growing and offers amazing nutritional and financial benefits for farmers and their families. A single serving of moringa leaf powder has the nutritional equivalent of two servings of kale greens. A side-by-side comparison shows that moringa has 2 times as much protein, 4 times as much calcium, and 6 times as much iron as kale. Unlike Kale, moringa also contains polyphenols and isothiocyanates, which have been studied extensively for their role in helping people protect against heart disease and cancer. Anemia is a condition when the blood doesn’t have enough healthy red blood cells or hemoglobin to transport oxygen to the body’s cell. Anemia can result in fatigues, lightheadedness, and shortness of breath. The condition currently affects 3.5 million Americans. Recent studies suggest that moringa leaves may be better at improving iron sufficiency than conventional iron supplements. One tablespoon of moringa leaf powder provides an excellent source of iron. Moringa also has 7 times the amount of iron as spinach. Diabetes remains the 7th leading cause of death in the US, 95% of which are type 2 diabetes. Prediabetes is a condition that causes higher-than-average levels of blood sugar without adequate levels of insulin, which leads to glucose building up in the blood instead of being converted to energy. Glucose builds up in the blood can lead to serious health problems, including blindness, kidney failure, heart disease, and even stroke. 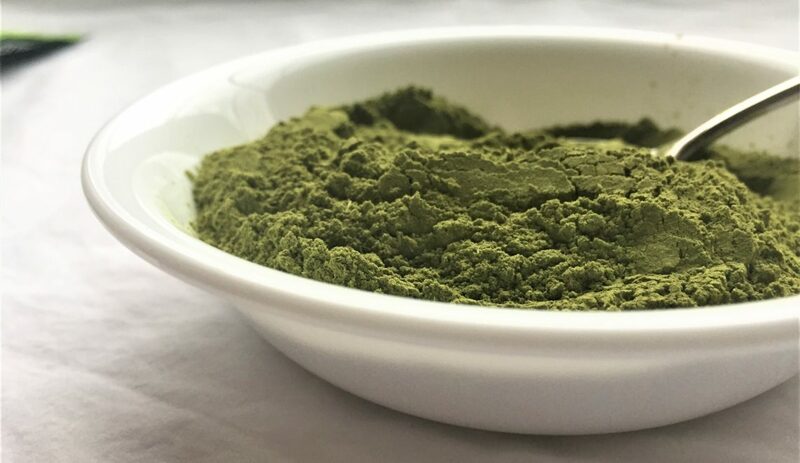 Multiple studies suggest that moringa leaf powder can help to significantly reduce blood glucose levels, cholesterol, and increase glucose tolerance. Antioxidants fight against oxygen-free radicals, which can contribute to cholesterol build-up and inflammation. Moringa is packed with antioxidants and fiber. Studies suggest that moringa may help reduce the number of free radicals, improve the function of the heart, and prevent cell damage along blood vessel walls. 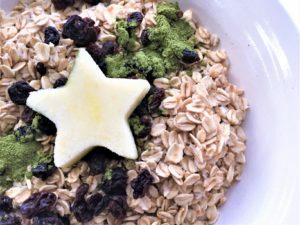 Fiber can contribute to heart health by improving bowel movement, lowering cholesterol, and reducing the risk of stroke and diabetes. 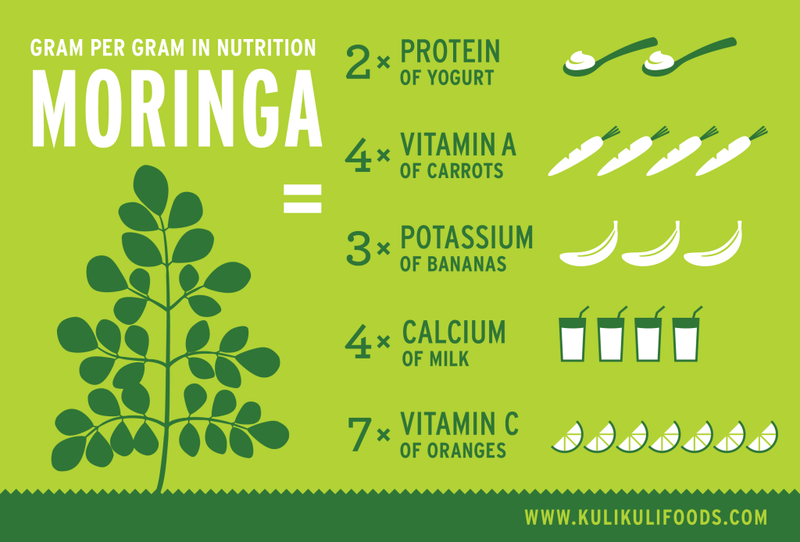 A single serving of moringa gives you 12% of your daily fiber needs. We recommend mixing Kuli Kuli Pure Moringa Vegetable Powder into a bowl of oatmeal. Inflammation can be a sign of a healthy immune system; it is the body’s natural response to quickly repair an injury or fight off a potential health threat. While more research is needed to fully understand the anti-inflammatory benefits of moringa, research suggests that moringa has many anti-inflammatory properties that could protect the body from several types of chronic diseases. However, when the body is in a state of chronic disease, the continual production of the systemic inflammatory response can be detrimental. Chronic low-grade inflammation has been associated with diabetes, obesity, cardiovascular disease, cancer, and Alzheimer’s. Direct antioxidants, such as polyphenols found in moringa and other fruits and vegetables, scavenge free radicals in the body that cause oxidative stress and damage –reducing inflammation and preventing cell damage. Indirect antioxidants, such as those found in moringa and other cruciferous vegetables like broccoli, stimulate detoxification pathways in the body, which have long-lasting anti-inflammatory and cell-protective effects. Moringa can help new moms with nursing by increasing the quantity of their breast milk. In a 2003 study, the amount of breastmilk produced by lactating mothers who were given 350mg of moringa every day showed a significant increase in breast milk in comparison to lactating mothers who were given a placebo. Moringa can also help make breast milk more nutritious. Consuming moringa increases the mother’s intake of beta-carotene, the precursor to vitamin A. Beta-carotene is especially important for newborn babies since vitamin A deficiency is linked to blindness, infectious diseases, and protein-energy malnutrition. In West Africa, the high mortality rate of children under five can be attributed to vitamin A deficiency. To address this mortality rate, moringa is used as a weaning food in West Africa. It is added to breast milk or breastmilk substitutes. In addition to basic digestion, the gut is also directly involved with our immune and hormone systems; effecting mood, appetite, metabolism, stress levels, and ability to deal with illness. Moringa contains nutrients, fiber, and phytochemicals that have been shown to promote gut health by stimulating the growth of beneficial bacteria and suppressing that of pathogenic bacteria. These compounds have anti-inflammatory properties that can reduce inflammation of the gut wall, thus improving the wall’s ability to inhibit the passage of toxins into the bloodstream. These compounds have also been associated with improved management of inflammatory bowel syndrome and a decreased risk of colon cancer and infections. 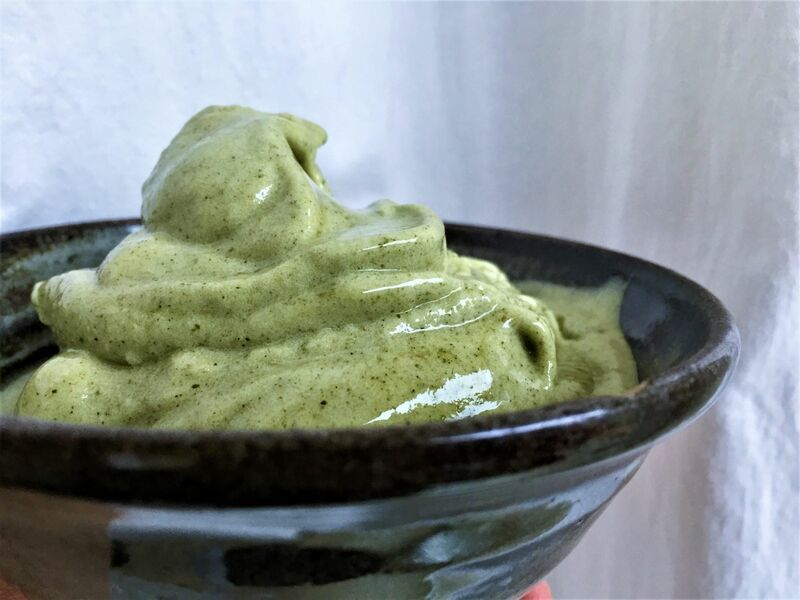 Make moringa flavored banana ice cream by adding frozen bananas, a smidge of non-dairy milk, moringa powder, and just a touch of vanilla extract to a food processor and blending until smooth. It tastes like soft serve ice cream! Proteins are made up of amino acids, some of which can be made by the body, while others, known as the nine essential amino acids, must be consumed in the diet. Moringa contains adequate levels of all nine essential acids. The “quality” of dietary protein is best measured by the Protein Digestibility-Corrected Amino Acid Score (PDCAAS) which factors in both the essential amino acid present and their digestibility. Moringa has the highest ranking of 1 on the PDCAAS scale of 0-1. Moringa is the perfect complement to a healthy lifestyle and is used by millions of people worldwide to gain the nutrients they need to thrive. Over 60% of Americans say that incorporating more vegetables into their diet is their #1 priority, but many find it difficult to get their greens at meals other than dinner. Moringa is extremely versatile and can be added to nearly any dish – sweet or savory. le and convenient way to add vegetables to any meal. Chef José Andrés, one of TIME magazine’s 100 most influential people, and his nonprofit, World Central Kitchen, worked with Kuli Kuli and the Haitian nonprofit The Smallholder Famer’s Alliance to launch a nationwide moringa recipe competition on Instagram, using the hashtag #MoringaInspired to raise awareness and support moringa farmers in Haiti.